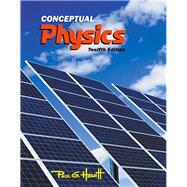 , by Hewitt, Paul G.
This program presents a better teaching and learning experience—for you. Former silver-medal boxing champion, sign painter, uranium prospector, and soldier, Paul began college at the age of 27, with the help of the GI Bill. He pioneered the conceptual approach to teaching physics at the City College of San Francisco. He has taught as a guest teacher at various middle schools and high schools, the University of California at both the Berkeley and Santa Cruz campuses, and the University of Hawaii at both the Manoa and Hilo campuses. He also taught for 20 years at the Exploratorium in San Francisco, which honored him with its Outstanding Educator Award in 2000. He is the author of Conceptual Physics and a co-author of Conceptual Physical Science and Conceptual Physical Science Explorations (with John Suchocki and Leslie Hewitt).